The week that passed went off better for the Indian Equity Markets as the benchmark NIFTY50 recovered bulk of its losses in the second half of the week. With the positive ending of Friday’s session, the NIFTY ended the Week with a nominal gain of 28.15 points or 0.27%. The NIFTY has managed to move past and stay afloat the 10490-mark but it is yet to clear the resistance zone of 10490-10535 comprehensively. 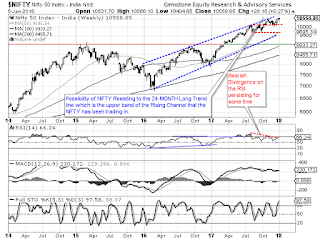 While we begin a new week from Monday, we are all likely to see the NIFTY trying to extend its gains. However, we also do not expect any major runaway rally and expect the NIFTY to find resistance around 10650-mark. The coming week will see the levels of 10650 and 10690 acting as immediate resistance for the Markets. Supports come in at 10490 and 10375 zones. The Relative Strength Index – RSI on the Daily Chart is 66.2384. 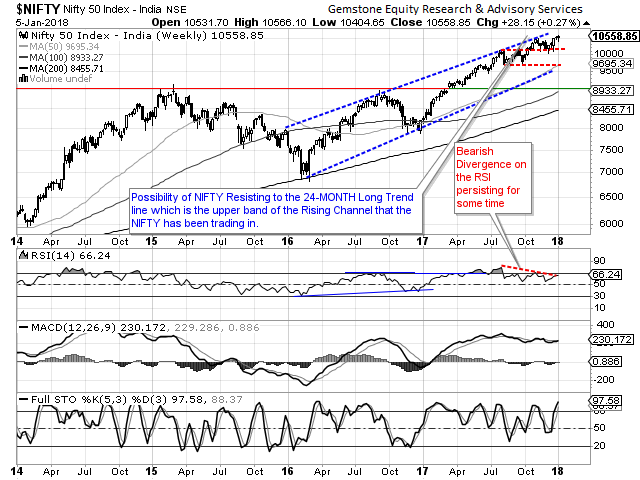 It continues to show Bearish Divergence as the NIFTY has marked a fresh 14-period high while the RSI has not done so. The Weekly MACD has shown a positive crossover. It is now bullish while trading above its signal line. On the Candles, a Hanging Man emerged. Since it has come after a up move, it may cause some rally to pause for a while in between. The pattern analysis shows that the NIFTY has managed to stay afloat above its critical support levels. However, it also shows that in event of continuation of up move, it may find serious resistance once again near the 24-month old rising trend line which falls in the area of 10650-10675 area as of end of the previous week. It may so happen that the NIFTY many not see any significant decline in event of any consolidation but also may not see any one-way up move beyond the 10675-mark. The session is also likely to remain highly stock specific and will continue to see certain pockets out rightly out-performing the Markets. We recommend avoiding shorts as the structural up trend remains intact. Select purchases may be made and profits be protected all through-out next week at higher levels. A study of Relative Rotation Graphs – RRG that PSUBANK has significantly lost momentum on a Weekly note. It is likely to continue to consolidate in the coming week as well. MEDIA, REALTY, may relatively out-perform along with select pocket of Small Cap universe. Broader Indices like MIDCAP and NIFTY Next 50 may also perform better. AUTO, INFRA and FMCG will continue to see positive consolidation with select out-performance. 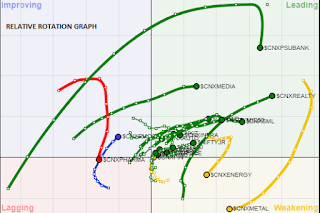 PHARMA are likely to continue to relatively under-perform the general markets along with Energy pack. IT also may not see any significant relative out-performance either.